The seal of the Bishop, unlike a shield, has a very important significance. The seal is an emblem or symbol used to identify or take the place of an authorized signature and to authenticate. When God is said to have sealed the Redeemer, the meaning is the He has attested to his Divine mission. "Do not labor for the food which perishes, but for the food which endures to everlasting life, which the Son of Man will give you, because God the Father has set His seal on Him" (John 6:27). As believers we are all sealed by the Holy Spirit, "In him you also trusted, after you heard the word of truth, the gospel of your salvation; in whom also, having believed, you were sealed with the Holy Spirit of Promise..." (Ephesians 1:13). And do not grieve the Holy Spirit of God, by whom you were sealed for the day of redemption (Ephesians 4:20). The Seal of the Bishop is God's chosen and anointed servant's emblem used to identify, as well as, authenticate his apostolic (sent to all Nations) authority. It is also the visible sign of the Lord's church and it's origin can be traced back to the day's of the early Church, which is recorded in the Acts of the Apostle (the ones who are sent), when symbols were employed to designate the jurisdiction of an Episcopate (the Office of the Bishop). It represents Christian Unity of all Covenanting Communions through it's insignia. The seal authenticates the authority conferred upon those who represent and are subject to the Lord Jesus Christ. The Office of the Bishop is in a long line of apostolic succession. This succession is indeed spiritual and this elevation to the Office of Bishop is declared by the badge or office set forth. The most significant focus of the crest is the Cross, which is the highest representation of the greater glory through Jesus Christ who is our greatest barer of the Cross. The Cross most importantly represents salvation, for we believe that Jesus Christ died on a cross for our sins, which is the focal point of the ministry assigned to the Son of Man. The Crown which is purposefully placed at the top represents the Kingdom of God; it is the Royal System of Heaven, the Headship of Jesus Christ over the Church and the Government where God him self reigns, "But I want you to know that the head of woman is man, and the head of Christ is God" (1Corinthians 11:3). The Crown is also a symbol of hope for that which is to come. "Finally, there is laid up for me the crown righteousness which the Lord, the righteous judge, will give me on that Day, and not to me only but also to all who have loved His appearing" (2 Timothy 4:8). This consecration Service with it's use of candles on the Communion table is special and peculiar to the participants as they have been set aside to hold up the light in this dark age. The light of the glorious Gospel of Jesus Christ is the only passage out of the clutches of sin and deprivation. Each man and woman in Christ is solemnly reminded of the awesome tasks before him or her to be examples of "salt in the Earth" and "light of the world". 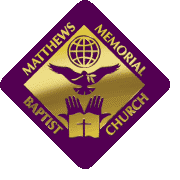 Therefore as we acknowledge the official elevation of our Senior Pastor to the Office of Bishop over the Matthews Memorial "Kingdom Building Disciples Global Ministries", may God grant our new Consecrated Bishop Wisdom, knowledge and discernment of these distressing times. We pray that God will continue to give our Bishop the heart of a Shepard, boldness to proclaim the Word of God with authority given to him by the Holy Spirit in our Community, across this nation and around the world. We pray that our Bishop will continue to feed the flock until the Chief Shepard shall appear to give him a crown of glory that fadeth not away (1Peter 5:4).